"Christmas with the Teen Titans"
I did this piece for fun for the holidays. 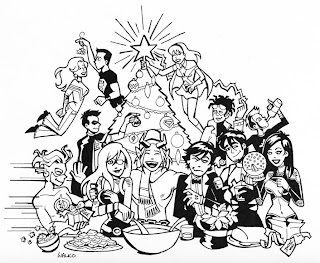 Here's Robin, Kid Flash, Superboy, Wonder Girl, Static, Bombshell, Aquagirl, Blue Beetle, Kid Devil, Miss Martian, Ravager, and Zatara celebrating the season! Hope everyone has a wonderful safe holiday! I really love this piece Bill. It is absolutely my favorite bit of art you have ever done. Congrats on such a well-done piece of art that catures the Christmas spirit very well! Made of Win. I'm really digging the drawing style. Except that I know these are actually cosplayers. Why? Because the REAL Titans are too angsty for Christmas cheer. Or dead. Oh, yeah... taht puts me in the Christmas mood. Awww... see why can't we have comics that are happy like this?